Danforth provides excellent customer service. At one point, I needed to reach a representative over the phone to work out payment options. It was quick and effortless to speak to an actual person that gave me helpful assistance. As for the jewelry itself, Danforth provides a wonderful catalog at excellent, competitive prices. They make shipping worry-free as well. My wife-to-be is still amazed with the beauty and quality of her engagement ring, even 3 months after my proposal. I would highly recommend Danforth to others. This 14k white gold fancy engagement ring has shoulders that fold back over to hold a 2.5 mm round blue sapphire on each side. 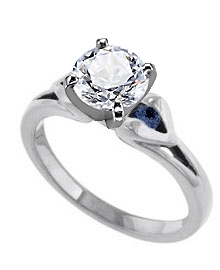 Pair this ring with our sapphire band that compliments its shape. I'm very impressed with the the engagement ring I bought for my now Fiance. I'm just so happy with how it turned out. It left my Fiance speechless when I presented it to her and the tears flowed. Thank You so much for making this moment so much more special. It was beautiful. Thanks! You guys were the cheapest and best quality for the money I paid. I am very pleased and will direct more people to your site. i bought this ring to replace my first one that was stolen. it was everything i was looking for. i love this ring its beautiful and well made. i love the fact that your ring is made to order. i will be purchasing more jewelry from danforth diamond in the future.